Different types of starters are used to start the different types of an electric motor in engineering plants. Air compressor engineering, the compressor is driven by electric motor and these motors are started by starters according to the requirement. These starters may be fully automatic with a push button to operate. Another is a totally manual type, as per the design of the manufacturer and the choice of the customer. Here I will like to share the information about automatically operated and manually operated starters also. This consists of contactors with built-in coils and plunger. Pressing the starter’s button energizes the operating coil which closes the contactor. In order that the contactor may remain closed when the “Start” pushbutton is released, retaining contactors are required. These are closed by the contactor lever itself. Hence maintain the operating coil circuit, once it has been made and the contactors closed. 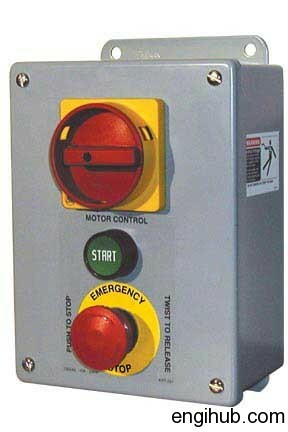 Irrespective of the position of the “Start” push button. Depression of the “Stop” pushbutton or failure of supply to the operating coil immediately comes to the contactor to open. By energizing, the operating coil from the same circuit as supplies the motor such an arrangement is equivalent to a no-volt release. For safety, all manual operating motor starting switch or circuit breaker return to the “Off” position in the event of failure of the incoming supply, and for this purpose an “Under voltage” or “No volt” release is fitted. The under voltage release forms an inherent part of the starting switch in all electromagnetically operated starters but is incorporated into the starting switch. With drum type AC Starters having a manually operated starting handle, the starting switch is fitted with a spring which biases the switch to the “Off” position, but is retained in the “On” position by a mechanical latch fitted in the starter is a shunt-wound electromagnet or solenoid excited by the supply voltage. In the event of supply failure, the plunger or armature of the solenoid or electromagnet is released and is arranged to knock off the hold-on latch and so return the switch to the “Off” position.